Norwich Cathedral - a Minster site? Could it be that the Close Norwich (and Great Hospital) are the fossil of an earlier minster? Occupying an area on as bend in the river? The original site of St.Helen's is in line with the Cathedral, but the churches within the imagined vale are widely dispersed. On the plus side - the site does seem to tick the boxes that Blair suggests for a minster site ! The time and miles of a pilgrimage, however long or short, are a threshold. The time and the miles of a pilgrimage provide an opportunity to reflect and reach a new understanding. This is why pilgrimages are often given as a penance. They allow for amendment of life! All Christian Life is Pilgrimage From in the waters of baptism we embark on a new life. Through the path of life, following Jesus who is "the Way, the Truth and the Life. "Here we have no abiding city, but we look for one that is to come. ( Hebrews 13.14). There were three children at Family Service at Coltishall today. We had a good time retelling the Easter story in a slick 45 minute all age worship format. I hope that it was simple and profound, something that everyone could engage with in their own way. Afterwards I found myself contrasting and comparing how it is now and how it was back in the day, during the 1970s when I was a curate in a Surrey suburban parish. I remember, we had over 120 at Sunday School and our own version of St. Matthew, sitting at the seat of customs, marking their attendance on their record book. And, yes, once a year they got a prize - but only if they had attended a minimum number of Sundays! Ahhh! Happy Days!? Well, not really! Attendance at Sunday School seemed to inoculate children against adult involvement. The passing out ceremony, before they went up to big school, was the great dismissal service. After which we never saw them again! And I am not sure that I was wandering lonely. I had, rather, strode manfully, through the village and along the disused railway line with plenty of time to ponder on the way. The primrose path that leads to the everlasting bonfire. I was looking for clues to give me a better understanding of what I think of as "my Hautbois font-base." I imagine that it is on the basis of the next picture that the scene depicted is interpreted as slaying of the dragon Fafnir by Sigurd as recorded in the Volsunga Saga. At this alarm bells should ring! The Volsunga Saga is late 13th C. The earliest German versions of the story, in which Sigurd is called Siegfried, begin in 12th C! However, a brief outline of the story is told in the Anglo Saxon epic, Beowulf. It is a text that J.R.R. Tolkien argued must have come from the Conversion period, perhaps some date close to 700 C.E.. It is 9 years since I launched the Churches Together on the Broads web page to promote our heritage churches . By 2016 it had done its job and run its course. Many thanks to everyone who has shared in the journey and has picked up the baton. I'll allow myself a glass of something tonight and drink your health! It was great to meet an old Norfolk friend, in pride of place, welcoming visitors to the Anglo Saxon Kingdoms Exhibition at the British Library! He represents the old East Anglia. 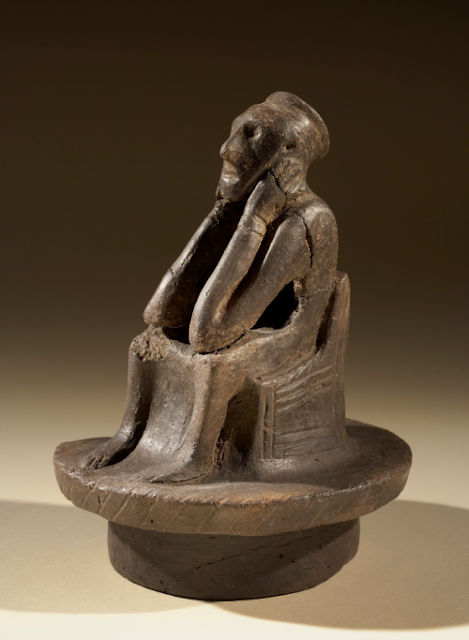 East Anglia before Christian missionaries began the conversion in the 7th C.
Made of clay, the model of Spong Hill Man forms the stopper of a cremation urn ' Looking at him in a new light, he seemed less like one of the three monkeys, perhaps somewhere between Rodin's Thinker and Edvard Munch's The Scream, as he contemplates the mysteries of life and death. For such as him St.Felix established a church close to Spong Hill at North Elmham. A church that was to become the centre of the diocese until it transferred to Norwich in 11th C.
Another Norfolk treasure - the (the newly acquired) Whinfarthing Pendant - was displayed nearby.